Stairs usually occupy the most prominent position in the home, so it's essential to get the design right. A striking staircase can make a wonderful centrepiece to wow your guests, as well as providing a practical purpose. But don't just think about looks - safety is another core consideration. 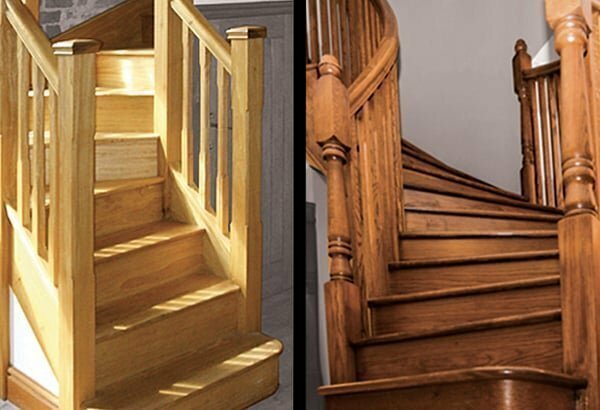 Many staircases in older properties don't comply with today's building regulations, so fitting new stair parts will help bring your home up to modern standards and increase its resale value at the same time. But where do you start? 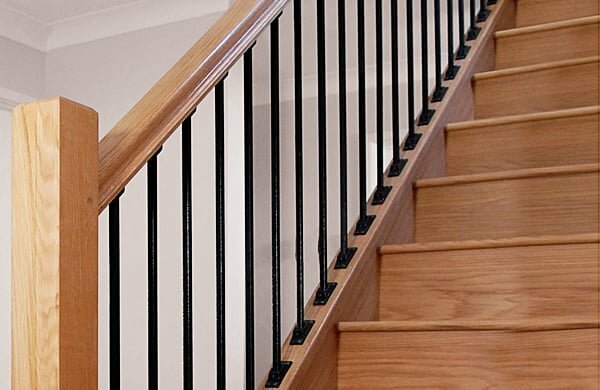 Whether you have a period cottage or contemporary townhouse, we can offer some pointers to help you choose your ideal staircase or replacement stair balustrade. Traditionally, of course, most domestic staircases are made from timber. But you can also opt for metal, glass or a combination of materials to create something a bit different. Wood is probably still going to feature in your staircase - at least as far as the handrail and baserail are concerned - but you might decide to combine it with steel spindles (also known as balusters) or glass panels for a modern look. Even glass treads and risers are possible nowadays. Timber is a wonderfully warm, versatile material that will look good in any setting. Wooden stairs are suitable for all types of homes – whether rustic, urban, modern or traditional. Wood opens up a wide variety of design possibilities, including curved steps, closed or open risers, turned newels and different styles of handrail. Spindles, in particular, can be worked on to produce ornate shapes or left plain for a clean, minimalist effect. You also have the option to fit matching wall panelling for a traditional look. For anyone with a timber floor, extending the same type of wood on to the stair treads is an excellent way of bringing together the various levels of your home. Alternatively, you can use contrasting timber to make your staircase stand out as a distinctive architectural feature. Steel staircase spindles shaped to look like wrought iron are becoming more and more popular. As well as traditional designs, many contemporary variations are now on the market to provide an interesting twist. Metal spindles are extremely durable, and straightforward to keep clean - just use a damp cloth. They can also be easily painted for an individual look to match your decor. Many different designs are on the market, so it shouldn't be too hard to find something to suit your home. However, you needn't limit yourself to choosing just one type of baluster. Many home owners mix and match two or three different styles in an alternating pattern to create their own unique stair balustrade. You might decide to combine different types of wooden stair parts or use them to together with other materials such as steel and glass. As metal spindles are mostly narrower than timber ones, you'll find they won't block out the light to the same extent. This means they are a particularly good option for cramped or poorly lit landings and hallways. Metal makes an extremely versatile, durable staircase component, and is available in many forms. For a sleek modern balustrade, try pairing brushed nickel with an oak or pine handrail and baserail. Grey gun-metal style brackets twinned with oak balusters or glass side panels are another popular combination. You can also use spindles made of wood and metal for a slightly different look. Contemporary glass panels can create a stunning effect when used in combination with either wooden or metal handrails and newel posts, adding a touch of glamour to the stair banisters. Glass allows light to flow freely through rooms and between different levels, making the whole property feel brighter and more spacious. 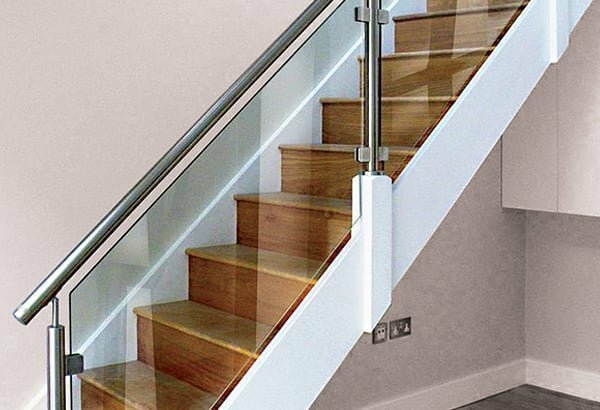 This quality makes glass stair balustrades ideal for small spaces and dark rooms such as basements and poorly lit landings. These stair railings are also perfect for split-level apartments, offering an attractive, stylish means of access from one level to the next without reducing the amount of natural light. Some home owners compromise by using glass for the lower part of the stairs only - perhaps for the first few steps, or a short flight up to a half landing - and standard balusters for the rest of the staircase. Check out the Richard Burbidge Fusion and Elements Glass ranges for ideas. 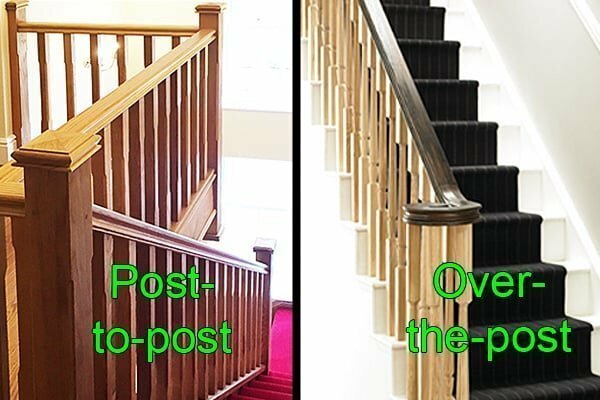 Used in the majority of staircases, the post-to-post system is the strongest and most economical. The handrail is fitted into the sides of the newel posts for maximum support, and secured with mortise and tenon joints. This is the best configuration for staircases that change direction. In the over-the-post design, also called a continuous handrail system , the handrail runs over the top of the newel posts, finishing at the bottom of the stairs either in a luxurious, decorative swirl called a volute, or in a straight line with a gently rounded opening cap. Because more attachments are involved the joins are not as stable as in the post-to-post system, so this design is most suitable for single, straight-flight stairs with no change of direction. Although the system doesn't come cheap, it produces a great wow factor and is frequently used in upmarket developments as a sign of quality. At Pear Stairs we supply both standard and bespoke handrails to suit individual requirements. While the appearance of your stairs is obviously a major factor in your decision-making, safety matters just as much. The handrail , above all, should be easy to grasp and pleasant to the touch. Pick one that is comfortable to hold. Unusually wide or narrow handrails tend to be awkward to use, and you should always put security before looks - although the two can often be combined. Oak, ash, pine and hemlock are some of the most common timbers used in handrail construction, with sapele - a West African hardwood similar in appearance to mahogany - also becoming increasingly popular. Metal and glass rails can be slippery, so are not recommended for use by elderly residents or young children. According to UK building regulations, if your stairs are less than 1m wide you are only required to have one handrail (on the outer side). However, for extra security many householders like to fit a as well. Various styles are available, with the mopstick handrail being the most popular. If you don't fancy a plain wooden one, consider adding metal end caps for a contemporary twist. Cut string or closed string? If you are replacing the whole staircase, you can choose what kind of string, or stringer, it will have. Cut string, also known as open string, is the most elaborate design. These stairs are made with the top edge of each tread cut away to show the outline of the steps, and are often accompanied by decorative brackets or mouldings on the side of the staircase. 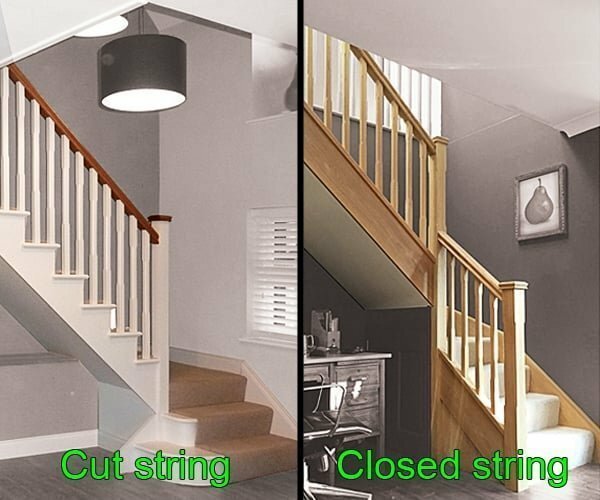 Closed string stairs are designed with the spindles set into a solid string - a narrow timber board which runs up the side of the staircase to provide support. The edges of the treads and risers are hidden from view, giving a clean-cut, streamlined look to the staircase. As strings are an important structural component of the stairs, they should be at least 32mm thick. To bring a more open feel to your staircase, you might choose to start the flight with two or three extended 'feature' steps such as bullnose or D-end treads . These can either be carpeted along with the rest of the stairs (if applicable) or left exposed for additional effect. When revamping your stairs, you need to make sure they comply with current building regulations. 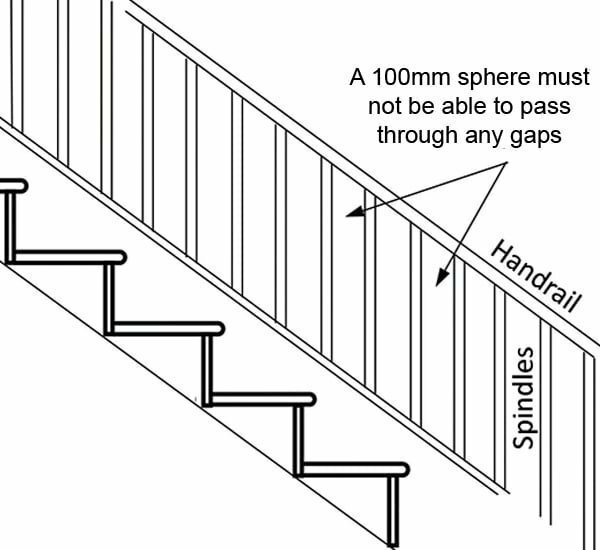 The most important aspect to bear in mind is that no gap anywhere on a staircase should allow a 100mm sphere to pass through. This is the case for every stair component - so all spindles (or glass panels) must be placed no more than 99mm apart. Note that the measurement is taken from the narrowest part of the spindle, so if you choose turned spindles you will probably need to order a larger quantity than if you were using a stop-chamfered or square design. Avoid horizontal railings, often referred to as ranch rails, as children may try to climb them. 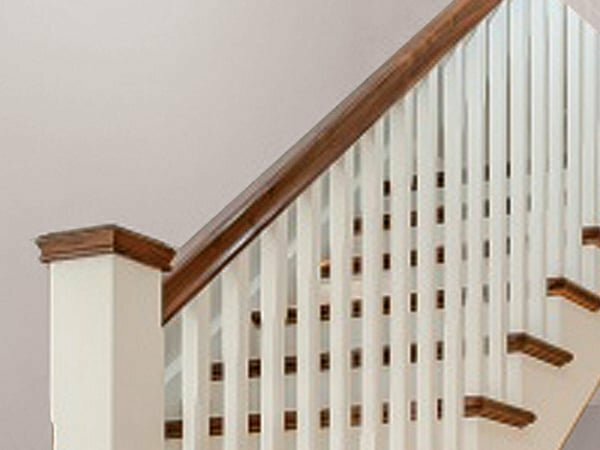 Many modern stair banisters come with pre-drilled slots for the spindles, so you can be assured they will meet the requirements. 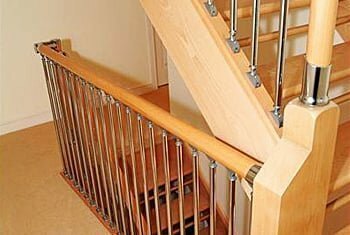 Staircase companies will be able to advise on how many spindles are needed for the length of balustrade you are going to install (normally two spindles per tread). The rule also applies to the distance between steps on open-tread stairs. If they are more than 99mm apart, you will need to fit riser bars at the back of each tread to reduce the gap. For new staircases there are various additional considerations to bear in mind such as pitch (steepness), width, headroom and handrail height. More advice is available in our Information Hub, but if in doubt, consult your local building control officer.